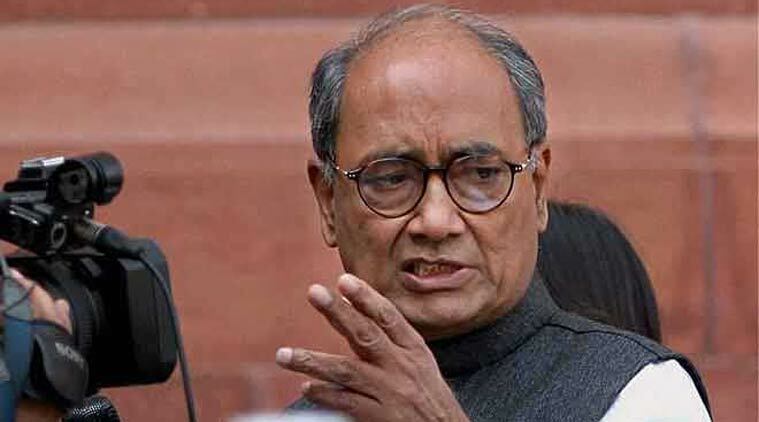 Senior Congress leader Digvijaya Singh said Saturday that last month’s Pulwama terror attack took place because there was an intelligence failure, but Prime Minister Narendra Modi was silent on this aspect. Singh, whose name was announced earlier in the day as the Congress’s candidate from Bhopal Lok Sabha constituency, also said he had not sought to question the air strikes carried out by the Indian Air Force on terror camps in Pakistan. “I did not ask for clarification. I said questions are being raised in international media, so the government should come up with evidence (of the air strikes’ impact),” he told reporters. “There was intelligence input from IG (Inspector General of Police) of Kashmir six days before Pulwama attack. A large convoy 2,500 CRPF personnel was moving…(terror group) Jaish-e-Mohammed had already issued a warning. “But a vehicle coming from the wrong side attacked and 44 (CRPF) jawans were martyred. This was a gross intelligence failure. But no statement came from the prime minister (Modi) and National Security Adviser Ajit Doval. Who will answer these questions?” Singh said. Forty CRPF personnel were killed in the Pulwama terror attack on February 14.